All summer long I’ve been looking for the time to take a day trip to Dallas with my teens to have a picnic and see the history. One thing or another always comes up. I hope we can get it scheduled in before school starts. My daughter is in color guard so she will be busy even before school soon. 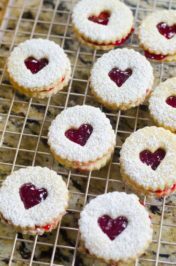 This little recipe will go along with us on our picnic. It’s a Picnic Pasta Salad which is super easy to stuff off into a jar and enjoy on the go. What I enjoy about picnic’s when it’s not 100 degree outside is the simplicity of the food. 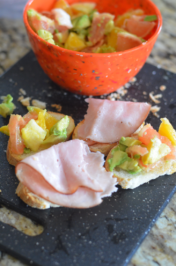 It can be leftovers from a big barbecue or fresh made sandwiches. My favorite picnic food is Italian pressed sandwiches paired with a good pasta salad. It’s easy to pack. Just wrap the sandwich in parchment and baker’s twine and put your pasta in any jar including recycled jars. 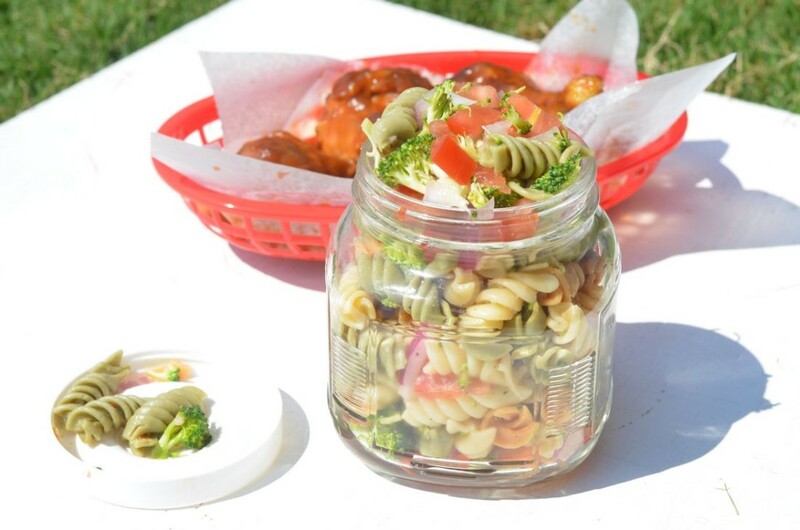 We like to reuse pesto jars for pasta salad. The jar show here I bought at Dollar Tree for spices and it ended up being too large. I use them for everything now though. I like to keep left packets of mayo, ketchup, mustard or whatever you get from food places in a plastic baggy in the fridge. Use them for picnics and on the go food. Do you have a favorite picnic recipe? If so, I would love to hear about it below in the comments. One link is welcome! 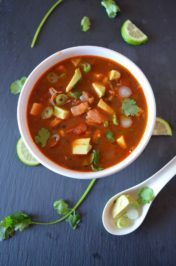 For other great recipes I have listed a few from other great #Foodelicious blogs. 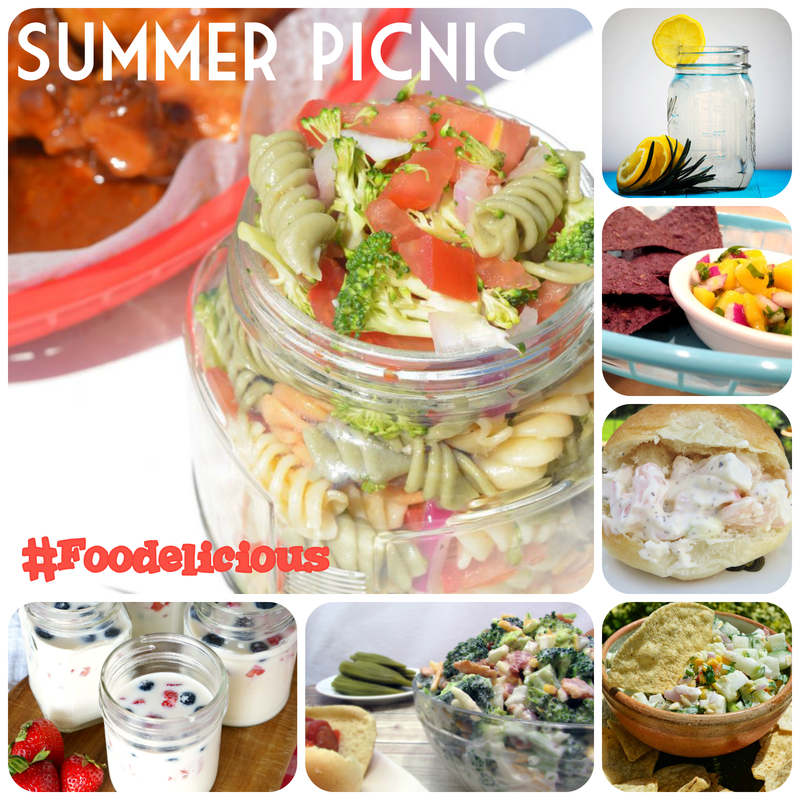 This is a recipe Picnic round up! Follow along with hashtag #Foodelicious on social media. A salad laced with broccoli, red onions, and roma tomatoes topped over pasta and viva Italian dressing. In a large pot, bring water to a boil. Cook pasta as directed on package. Drain pasta let cook for 10 minutes. Pour into a large bowl. Place bowl in freezer for 45 minutes. Diced tomatoes, onions, and broccoli. Place in medium bowl. Pull out pasta and top with vegetables. Add salt and pepper and fold to incorporate all the vegetables and seasonings. Shake dressing and pour over pasta. Toss until dressing covers pasta well. Refrigerate for a later time or serve immediately. Top with parmesan cheese for extra flavor. This looks fab! Fresh and perfect for a summer picnic. This looks great! I love finding light salads for the summer. We have an abundance of tomatoes right now so this is perfect. 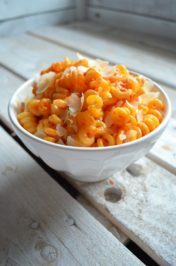 I love pasta salads for picnics! This looks delicious and I love the look of serving it in the jar! I love a good pasta salad. Perfect to bring to the beach! I’m a sucker for pasta salad. Your version looks fantastic! 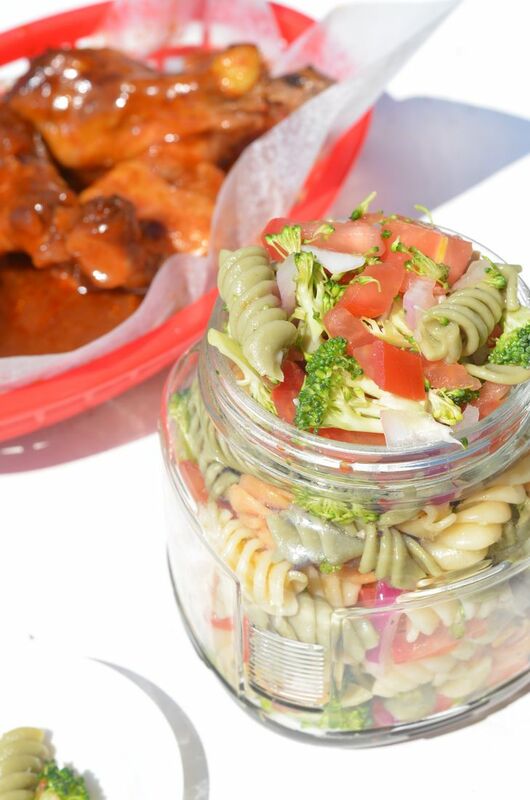 Pasta salad is so easy and goes so great with bbq. Thanks for sharing I can’t wait to try this when the rain stops here. This looks really yummy but I love the way you have served it! It would be so easy to just sit the jars down into the cooler for the picnic!